The Gaming Pro Carbon AC has been MSI's top dog for the mid-range across a range of AMD and Intel sockets over the last few years. You can usually expect a smattering of premium features, but with a much lower price tag than the all-singing, all-dancing models that typically retail for over £200. If you want that touch of premium, such as RGB lighting, M.2 heatsinks, decent power circuitry, and VRM cooling and you're in the market or already own one of AMD's 2nd Generation Ryzen CPUs then you'll want to keep on reading. The MSI X470 Gaming Pro Carbon AC is the cheapest X470 board we've reviewed so far, although we'll be looking at cheaper models next week. 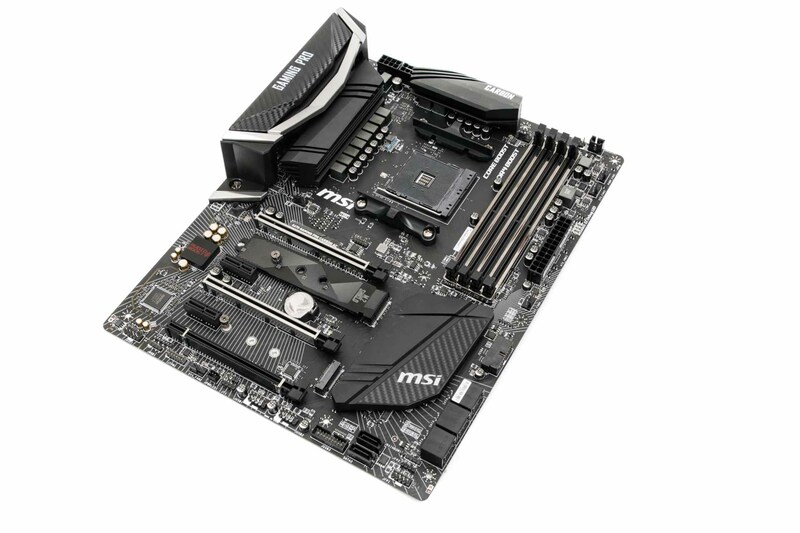 MSI has made a few cutbacks to get the price here, which is to be expected, and it's easy to make comparisons with the X470 Gaming M7 AC. 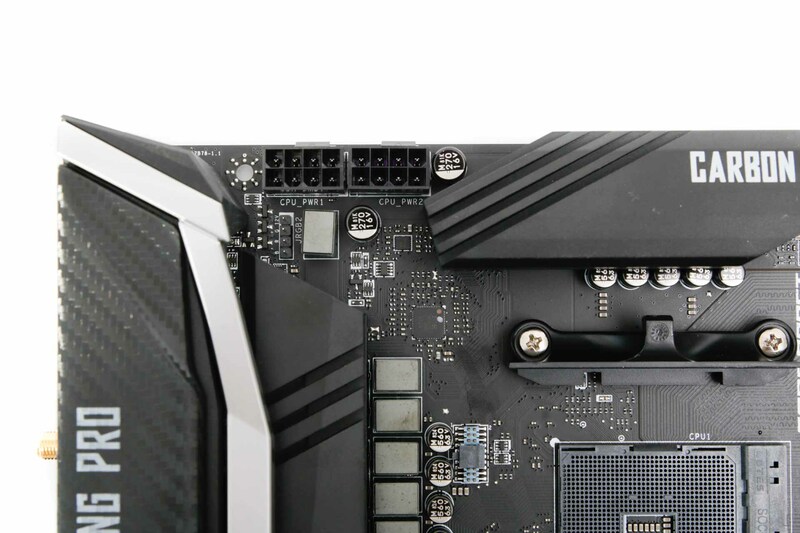 There were a total of 16 power phases on the M7, but that falls to 12 with the X470 Gaming Pro Carbon AC, although you still get the twin eight-pin EPS 12V connectors for the CPU. It's not necessary to use both, of course, and the second is only going to be useful for extreme overclockers, but it's a nice touch nonetheless. 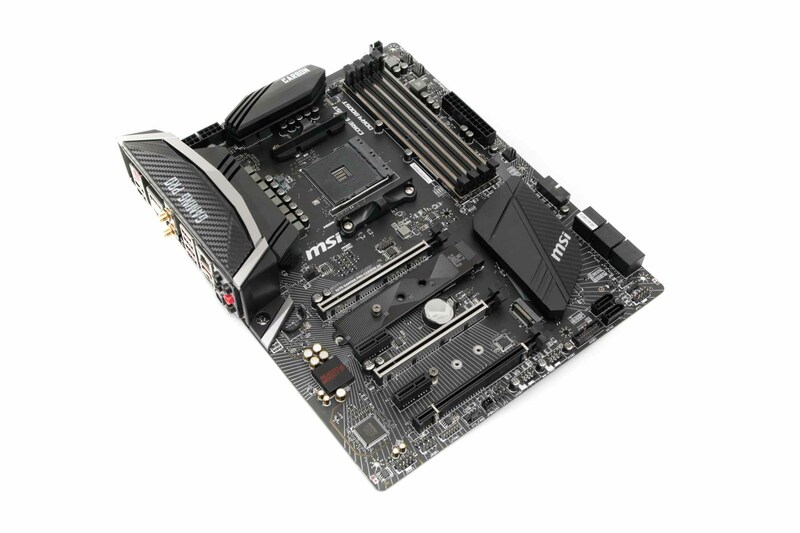 VRM cooling is reasonable too with two large heatsinks, and while there's no heat pipe linking the two, MSI seems to be doing good things when it comes to reigning in power consumption, at least with the M7 board we looked at recently, so we're hoping for more of the same here. RGB lighting is fairly restrained, but you get LEDs under the PCH, I/O shroud, and beneath the right side of the PCB, and these are individually controllable too. In terms of headers, you get a pair of standard four-pin RGB headers plus a single three-pin header for addressable LED strips. 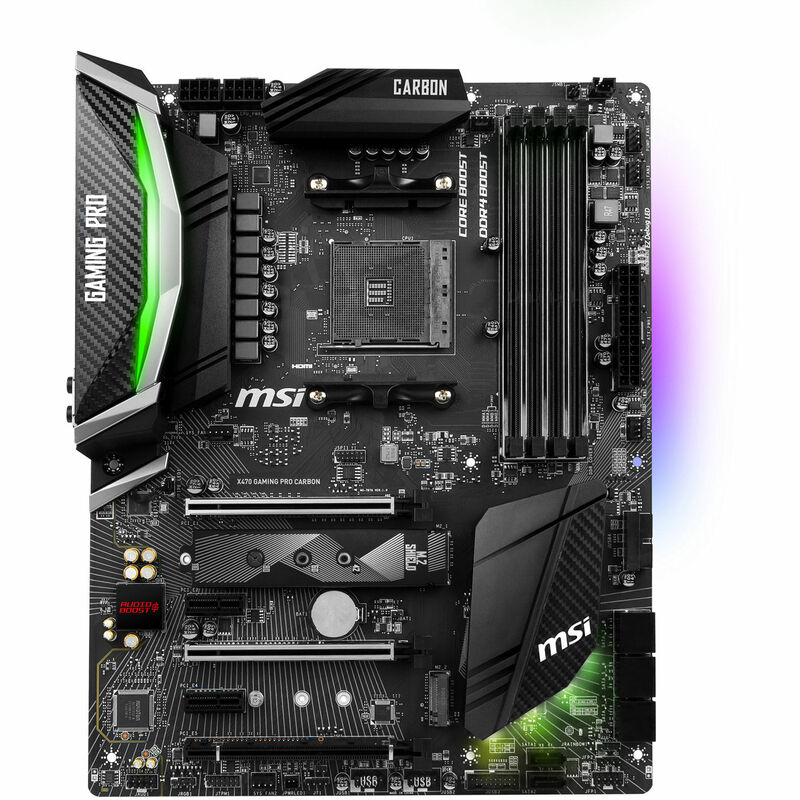 It's a pretty good-looking motherboard, and it remains colour-neutral, so it won't interfere with your case's colour scheme if you have one. 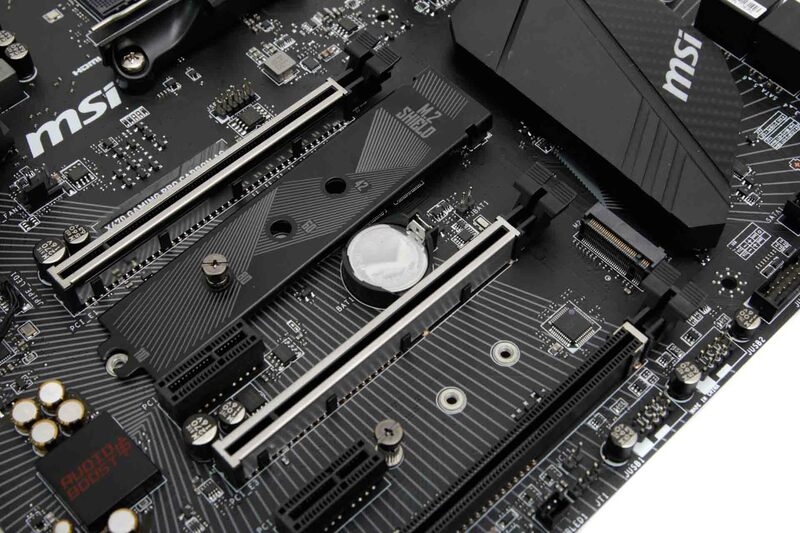 The X470 Gaming Pro Carbon AC makes the rare move of including eight SATA 6Gbps ports rather than the usual six, and this trumps most £200+ X470 boards we've seen. These are powered by the X470 chipset, although there is some mixing and mashing going on in terms of bandwidth. 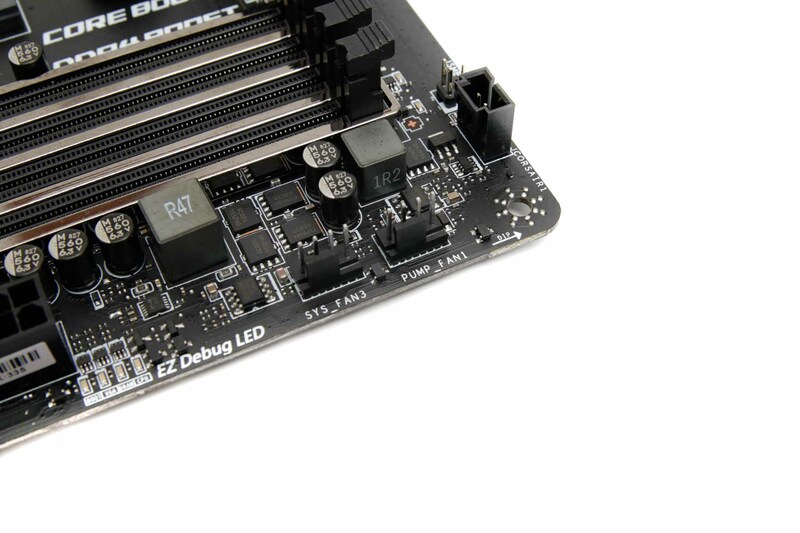 For example, one SATA port will be unavailable if you use a SATA M.2 SSD in the second M.2 slot. The M.2 ports also have a particular bandwidth arrangement that you'll need to pay careful attention to if you'll be using them. The primary slot at the top has its own x4 lane feed from the CPU so offers full PCIe 3.0 x4 bandwidth, but it is not compatible with SATA SSDs. The fact it has a heatsink here makes sense; this is where you'd want to put your toasty NVMe SSD. The second slot, though, is limited to PCIe 2.0 x4 bandwidth, and this will bottleneck modern NVMe SSDs such as Samsung's 900-series. 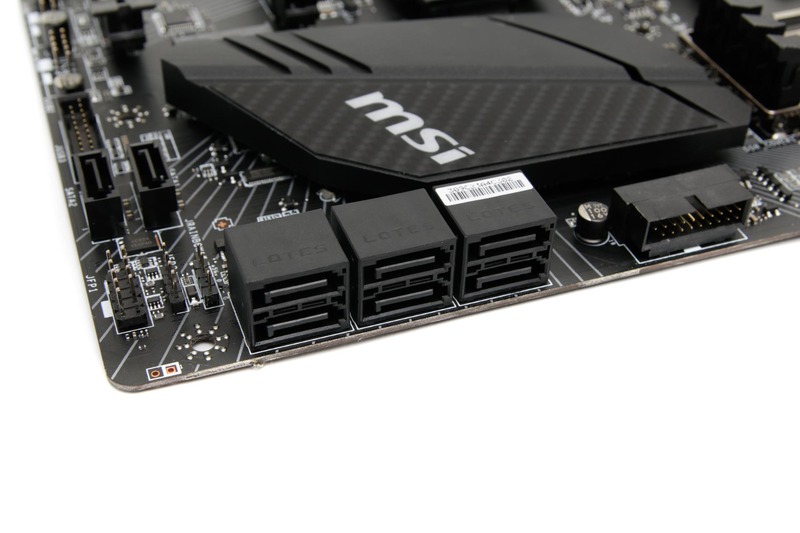 Thankfully, the port also supports SATA M.2 SSDs, so while you won't want to be playing with twin Samsung 960 Evos in these slots, the possibility exists of using the top slot for a PCIe NVMe SSD for your OS and games plus the lower slot for a larger, cheaper SATA SSD, or simply reigning in the budget a little and just using the latter instead of a 2.5" SSD and getting shot of some cables, which is always a good thing, given that M.2 and 2.5" SATA SSDs are similar in price. MSI's fan control abilities via the EFI and software aren't quite as extensive as Gigabyte's, lacking the ability to switch fans off, for example, but they still offer a decent amount of control. You get six four-pin fan headers with one dedicated to water-cooling pumps too, which is able to dish out 2A/24W and obviously alter that power or provide a PWM signal to control pump speed. You can use that for AIO cooler pumps, but with 24W on tap, there's scope for controlling DIY kit pumps from the likes of Laing too. As usual, the AC version of the board offers onboard 802.11ac Wi-Fi, and you get the usual screw-on antennas in the box too. The rear panel also offers HDMI and DisplayPort outputs should you wish to drop in one of AMD's APUs (you'll obviously need a discrete GPU for anything else), and there's a handy seven Type-A USB ports. Another cutback compared to the M7 is the USB 3.1 Type-C header for compatible cases, but you do get Type-A and Type-C USB 3.1 ports on the rear I/O panel. There's also a lack of onboard overclocking and testing tools, but thankfully you do get a CMOS clear button on the rear, although we never had cause to use it. Thankfully, MSI hasn't cut back on the networking or audio; you get the usual Realtek ALC 1220 audio codec plus Intel's I211AT Gigabit LAN controller.